Certificate as awarded to The Elephant following this nomination. I'm verklempt. Discuss among yourselves. 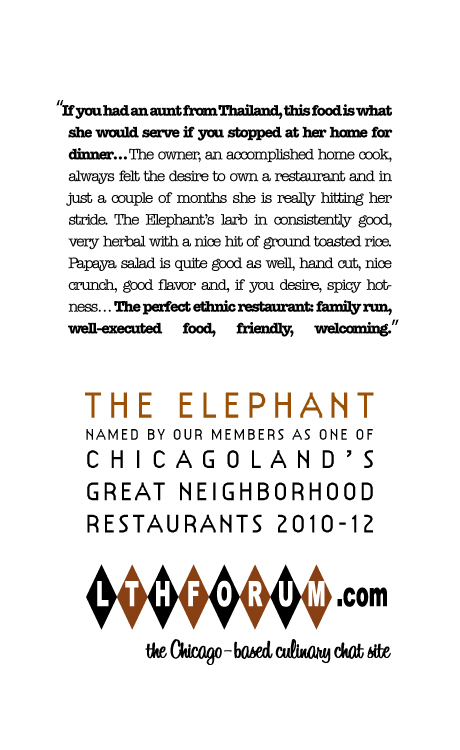 I heartily second your nomination of Elephant Thai for an LTHForum GNR. Warm, caring, friendly people, serving terrific food that contains that all too often missing element, love and care. I thoroughly enjoyed the lunch I had there a couple of weeks ago. I'm not an experienced Thai food eater, but I ate quite a few second helpings of the food that was ordered. The two meals I have enjoyed there were both excellent. Good food, nice people, good prices, pleasant place. Plus it allows us suburbanites to stop at Superdawg for a quick snack before or after dinner . A great neighborhood experience for me, every time. I'm lucky to have Elephant Thai be a great neighborhood restaurant in my neighborhood. I've eaten there twice with a large group of other LTHers. I've gotten take-out on my way home. I've taken friends there for dinner before or after a movie or some beer [how convenient it is to have Moher just up the street . . . the amenities of the area have picked up in the past year or two!]. Their food is always excellent. I've been eating Thai food since the late 70's; I used to drive up to the Thai Room on Western from Hyde Park just because it was the only Thai restaurant I knew about [was there an earlier Thai restauraunt in Chicago?]. Anne and her family do fresh, well-prepared renditions of the Ameri-Thai favorites, and keep a round of specials going on the board for those of us who like to try different things sometimes. Elephant is, to my way of thinking, the perfect ethnic restaurant: family run, well-executed food from the family's country of origin, a clean, well-run establishment in a storefront [there's just something about a storefront....], friendly and welcoming. I hope Elephant gets promoted from great neighborhood restaurant to Great Neighborhood Restaurant. In our first round we awarded the prize to two places which do ground-breaking, mind-expanding and cliche-busting Thai food, Spoon and TAC Quick. Given the amount of discussion and championing they've enjoyed here (and in our past lives on Chowhound), it would have been a serious oversight not to honor them in the first round as quintessential GNR choices. Elephant Thai is of a different order to me, but equally worthy-- for the reasons that we say "neighborhood" in the award title. Elephant Thai not only introduced Thai food to a neighborhood where it hadn't existed before, showing how ethnic foods can break out of their enclaves or Hipster Central and win converts even in neighborhoods where the crowd tends to be older and probably a bit conservative in its tastes, but it has all the other virtues of a superior neighborhood joint-- high quality food, a specials board that shows some ambition and gently works to expand the horizons of its customer base, and personable owners who recognize customers by name (or at least dishes) and will even share what they've made for lunch. I just ate, purely because of where I happened to be around lunchtime, at a place that won an award from another, wood-pulp-based source-- Tom Yum Thai. I could see that they were trying to do a better job with the Amerithai standards than the average place, and everything was very fresh-- but the result was neither fish nor fowl, neither Amerithai-flavored enough (too little sugar and soy sauce), nor Thai-flavored enough (too little fish sauce or chili). In that case I suspect a neighborhood that was desperate for Thai has gone overboard in its enthusiasm for a restaurant that rises only ever so slightly above average, and in some ways is sort of ill-served by what ambition it does have (if you're going to make Amerithai, then by gum sell out and make sugary, salty Amerithai, don't make watered-down Amerithai). The balance of all these factors was not there in the food. Elephant Thai is, to my mind, the place that has balanced them extremely well; there was room for any Thai restaurant in Edgebrook and luckily they got one with a sure hand and a commitment to real, pleasing flavors. Since Elephant Thai was originally my nomination, I suppose I should speak up. Elephant Thai has continued to provide well above average Thai food to a community that is starved for any type of restaurant (though it's getting better). Over the last couple of years since the original award, Elephant Thai has hosted me for lunch and/or dinner so many times that I can't even hazard a guess as to how many. Ann has also hosted several LTH dinners where she has gone out of her way to cook some special off-menu items. Every time I go in there, she always brings me out some sort of surprise to go along wit my meal. It might be a special dish she cooked up for her family, or maybe just part of the the always tasty staff meal. Just say YES to Elephant Thai's GNR renewal. A great place where the food is delicious and the house is very accomodating. This a restaurant that any neighborhood would be proud to have. I say 'yes' to a GNR renewal for Elephant Thai. For some reason, I never noticed that this was up for renewal until recently (hence my lack of posting). I've only eaten here once, so take what I say with a grain of salt if you choose, but during a recent dinner here, I think that everyone enjoyed their dinner overall. In addition to those "datapoints" (God, I hate that term), ET has certainly satisfied the apparent "requirement" that it be posted about recently. Therefore, there should be no real debate about the renewal of a GNR for this place. I was thinking about what to write in support of Elephant Thai GNR renewal, which I most assuredly support, and it occurred to me Elephant Thai may be the restaurant to which I most often go. Quick lunches, dinner with my wife, the occasional home delivery, good food combined with Ann, the owner, charming personality. I'm happy to have Elephant Thai, a Great Neighborhood Restaurant, in my neighborhood. I have a sad addiction to the Emerald Noodles from the Elephant. I also love their very reasonable lunch combinations. A ton of food for $7. This March weather is making me crave their Panang and mussamun curry, and well as their delicious and fresh Tom Yum and Tom Kha. I used to go there a lot but have not been there since last summer. However prior to that it really was everything you wanted in a neighborhood spot, unpretentious and welcoming, but quite accomplished and subtly striving to broaden the palate of its neighborhood. Elephant Thai is not convenient to my neighborhood in any sense, but when I am up that way, I am more than happy to stop in and grab a bite. The food is reliably good, and they treat me quite well. The menu offers variety and some truly interesting options. And it passes my own personal GNR test - I wish it was in N'ville, or at least some place that is comparable. This is one of the few GNRs I really don't get. In our effort to visit as many GNRs as possible we went a couple miles out of our way to try the Elephant. Everything was good, but nothing was memorable. We were a little surprised at how ordinary Elephant was after trying the other Thai GNRs. To me, Elephant was a very good Thai restaurant, but I saw it as comparable to any "good" neighborhood Thai restaurant I've enjoyed over the years. I am in complete agreement with Turkob. I have eaten at Elephant several times: the people are nice, the food is good, but there are a lot of places that one could say that about. On the plus side, I don't think that they have slipped. If they deserved a GNR, they probably still do. But I've always felt that that there are dozens of Thai restaurants at the same level. If GNR meant good neighborhood restaurant, ET would be right there. Other than a forgettable taco stand, Elephant Thai is perhaps the closest restaurant to my house. I go there so often I rarely post about it anymore, but that doesn't mean that the place has declined in any way. It's a regular lunch destination, and The Chow Poodle even craves it for dinner. Despite tough times in the restaurant business, Elephant is generally full of customers most days. Chalk this up to the friendly personalized service and the fine food that consistently comes out of the kitchen. As the original nominator, I'm still just as enthusiastic about Elephant as I was back then and strongly support GNR renewal. Elephant Thai is a favorite, warm friendly owner, smooth efficient service, reasonable pricing and bright fresh flavored Thai. I am particularly fond of Larb, herbal with a textural hit of ground toasted rice, spicy coarse ground Thai sausage, hand chopped papaya salad, fragrant Boat Noodle, basil bright shrimp rolls, rich aromatic Tom Kha Kai, my favorite spring roll in town and a rotating board of tasty specials. Elephant Thai, Count me a fan! I've had nothing but solid delicious food each time I've gone with one of the most memorable tastes being a simple baked sweet potato the owner had made for herself that she shared when I showed interest and asked what she was eating. While my neighborhood includes numerous GNR winners (besides many other good food options), we're short on excellent Thai. I'd welcome the likes of an Elephant Thai to the mix. Yes on renewal.